Making noise while fishing can be good–or bad! With the arrival of fall and cooler temperatures, the waters along our Big Bend Natural North Florida Gulf coast have cleared. That clarity also makes big seatrout and redfish extremely spooky–wary of anglers and the loud noises they often make. But there are good noises, too. First the bad. When someone on your boat slams a locker lid or a cooler that noise transfers to the water and spooks fish, often within a hundred feet! The same goes for yelling, squealing for joy, or jumping up and down on the deck. Then the good. Popping corks, like those sold by Cajun Thunder or D.O.A. 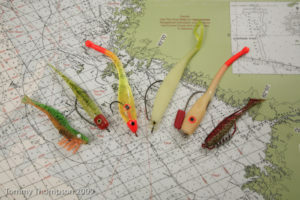 Lures, are a sure-fire and popular way of drawing hungry predators to your bait. The “science” behind using these corks is that game fish “hear” the sound of the rattling cork and are attracted, “thinking” a competitor is eating bait nearby. This sort of noise is very productive, especially if you choose the right bait to put beneath your cork. Small bait fish such as pinfish, grunts or mud minnows (shown) work well under popping corks. Live shrimp or plastic imitations are also good popping cork baits. No matter your choice of bait (and there are thousands that work! 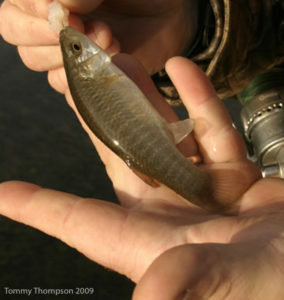 ), the technique for fishing with popping corks is critical. First, be sure to put a piece of fluorocarbon leader under your cork and be sure it’s the proper length to keep your bait or lure just above the bottom or the grass tops. Then, once you make a long, accurate cast, give the cork a big “pop” every 30 seconds or so. After popping, drag the cork rig a few feet towards you to cover more area, and repeat the process. And once you get a bite (the cork will submerge), give it a count of three and then set the hook. Repeat as needed, put your quarry in the cooler, and have a fun day on the water!